This post is sponsored as part of a #SwifferFanatic Ambassadorship. All opinions & experiences are my own. Have you moved a lot in your adult life? Since getting married, hubby and I have done four BIG moves – one between states! Every time it’s difficult – leaving friends and family, getting use to new areas and roads, plus all the hassle of packing and redecorating! But there’s one big advantage – a CLEAN SLATE! You get to start over with organizing and decorating your house, setting it up how you want and dream. Kind of fun, right? To help with the less exciting parts, here’s The 5 Best Moving Tips I’ve learned through the years. Now, I’m not going to tell you how to pack, or the ideal boxes to use – those types of things vary too much between each person and their preferences. But these things are pretty universal, in my opinion, and great for more easy moving. Whether you have help from movers or friends, they’re not going to know what room is ‘Bobbies Bedroom’ or even what floor things are in. Heck, even YOU may forget – and although writing on the box is helpful to a point, it takes longer to write them, and to read it. Instead, take some really cheap stickers – either colored, or get white and use markers to color them. For multi-story homes, pick a color for each floor. I did RED for the main floor because it’s like ‘STOP at this floor’. The 2nd floor was Green for ‘Good go GO Upstairs’. Then a 2nd sticker was on the box, matching a BIG sticker outside each room…. Then it’s just an easy glance to know where each box goes! Since footprints, dirt from boxes or even hair and fluff from pets or couches will still be getting on the floor, wait until everything’s cleared out, THEN give the floors a good cleaning! For the people moving INTO our old house, I wanted it super clean for them but didn’t have much time – so used my trusty Swiffer Sweeper&Vac to get the hair and fluff, then the Swiffer WetJet to give it a clean shine and get the last of that dirt. After we got into our new house, it just took a tiny bit to get our new wood floors shining after all the mover footprints! Your movers come to take your sofa out, only to leave a nice new scratch on the floor for your home buyers. Oops! Best to add the felt before things are moved, to protect the floors so the new owners can enjoy their new home in as best condition as possible. You also don’t want to wait until your piano gets put on your shiny new wood floors to put on the felt pads, since just one little nudge could leave a permanent scratch. Same goes for tables, chairs, couches, etc. that will be on scratch-able floors. Put the felt pads on before bringing them in to make sure they’re secure, and to make certain your new floor is protected. Before handing over keys to the new owners, clean up random scuffs and marks along the floors, base boards and such with a Magic Eraser for an extra good CLEAN SLATE. Also go around in YOUR new place to erase any marks – you want it as shiny and new as possible, right? Even if it’s just a cute ‘home’ keychain for the house keys as you turn them over, it will really make them feel special that you took a moment for a quick extra thought for them. At our last home, we even left our buyers a whole Swiffer Green Box (thank you Swiffer!) to help them with their own clean slate, as well as a watering can for the window flowers. It’s the little things that count! I’ve only been to NYC twice, and since my first experience in a hotel there was awful, I was really nervous coming again to stay for a few nights with my kids. Luckily, this New York City hotel was much better, and we had a fine stay with kids in NYC! While this trip was paid for by Swiffer/Citizen Relations for an event, this hotel review is 100% my own opinion and choice to share. We stayed at the DoubleTree Hilton Metropolitan on Lexington Avenue in New York City. I was relieved that it seemed to be in a more ‘upscale’ part of the city, since my last hotel from the previous experience was in a little more scary of an area. First of all, I wouldn’t say this hotel is AIMED towards kids or families, and I didn’t see many other kids there other than my own, but they were just great with our group. They didn’t even mind the kids getting their wiggles out posing in the lobby for me after a long morning of flying/driving. There’s a shop on the main level, as well as a business center with computers you can use (great for printing boarding passes) in case you forget anything, need to grab a soda, or want to grab souvenirs from the hotel. The staff was INCREDIBLE, always saying ‘hi’ to the kids when we were going to and from, asking how the day went, or asking how they liked the snow that was coming down on our last morning. And don’t forget the yummy cookies you receive at check-in! Since my kids were super excited, I didn’t have a chance to get any photos BEFORE we were already half-living in the hotel rooms, so please forgive the mess! We got 2 rooms – one with a king bed and one with 2 queens. My sister stayed with one kiddo in the king room, the rest of us were in the double queen and that’s where we spent most of our hotel time. Basic as far as hotels go, but for a NYC main area hotel it was nice – not worn down much, like many of the hotels, and it was plenty clean. The hallway was a bit noisy at night from people coming and going, and the sounds seemed to easily come through the door – but we slept fine overall and couldn’t hear other rooms. 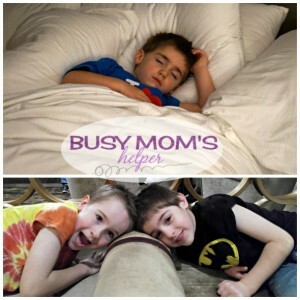 I loved that they had plenty of pillows for us – since my boys thought they needed several each! If you’re a person who really wants a decent view, make sure you don’t get a back-alley facing room like we had. I think this did help us not hear street traffic, but not very pretty to look at. Didn’t bother us any, though. There’s a bar & grill down by the lobby – which I sat in for a chat with a friend. The service was ‘eh’ and the food was ‘eh’ as well – I wouldn’t recommend it. They do have the Met Grill on the main floor that’s open for breakfast, which is where we chose to eat each day. I will say the price was a bit CRAZY – but reminded myself that it was NYC, and the better side of it, so we’d be paying that much at most places anyway. Be sure to ask the options, since they had 2 different buffet (general cold breakfast options: fruit, yogurt, cereal, muffins, etc – or also with hot items: french toast, eggs, hashbrowns, bacon, etc.) but also a order-by-item list. Plenty of juice options. They were AMAZING with my kids – a HUGE shout-out to JC at Met Grill for making the kids so excited to see him each morning, and helping our family have an even better stay. As for restaurants outside the hotel, there’s a little sandwich-type/health conscious one 2 doors down, a chocolate store right next door (yay!) and plenty within walking distance – they were a little higher price than I’m use to, but again it’s NYC and the less-scary part of the city. We did order pizza for dinner which was great, but we had to meet them in the lobby since they couldn’t bring it up to the room. Not sure if that’s hotel policy, the pizza place’s policy, or a NYC thing. No biggie! Next time you’re in NYC, consider staying at the DoubleTree Hilton Metropolitan for a nice family hotel stay! Do Store Brands Really Work as well as Swiffer Pads? I’m a Swiffer Fanatic, and as such this post is sponsored. However, all opinions are 100% mine alone. Do you like saving money? Of course you do! One great way to do this is by buying generic brands for certain things, which is smart. However, you also like having a clean house with as little effort (and cost) as possible, right? Me, too! 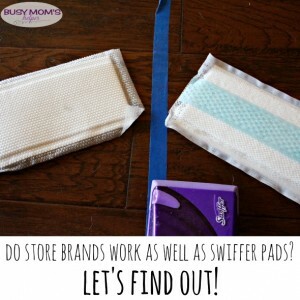 So let’s find out if store brands REALLY work as well as Swiffer pads…. I couldn’t fairly do this test without showing my floor BEFORE the cleaning – yes, I have two big dogs, so there’s dog hair all over the pretty wood. That’s my life – and one of the big reasons I need to regularly use my Swiffer sweeper (to get the hair up) and Swiffer WetJet to mop up any dirt, and paw prints. I didn’t do any prepping other than a strip of taping off two areas of the same size and ‘yuck’ level…. Here are our first contenders in this competition – the store brand on the left, and a Swiffer Sweeper pad on the right. You sweep before mopping, remember, so that’s why we’re doing this first. Using both in the same motion and the same square area, here’s what they each picked up…. Lots more hair – and dirt – on the Swiffer one. One reason for this? The Swiffer pad has a special addition to it that helps attract the debris, so they don’t just fall off. To test this out, I held each a little above the floor and gave it a little shake – not harsh, just a bump…. Lots more hair fell off the store brand 🙁 I think it’s safe to say Swiffer won this round! But what about the WetJet? Let’s go onto our second and final round, again with the store brand on the left and Swiffer on the right. After mopping each area with the same cleaner and motions, this is what’s left on each pad……..
Now look at that picture again….the top picture is after each did the same amount of area. Then the bottom picture is me taking the Swiffer pad over the store brand’s area again – looks like the store brand missed a lot more dirt! And the winner is – Swiffer pads! Sorry store brands, you miss out on this one. To get the same result, I tested and would have to use 2-3 store brand pads to get close to the same result as Swiffer. The price is already so close between the two, this makes it much more budget-friendly (and cleaning friendly!) to use Swiffer. Guess this is one area where I’ll always go with Swiffer than the store brand! Say Yes to the Mess instead of No to Your Kids! I was provided an expense paid trip to attend the #YesToTheMess event by Swiffer. All opinions are mine alone. How many times have you told your kids ‘no’ to something because you didn’t want to deal with the mess that would likely happen? I have WAY too many times! I love the latest Swiffer campaign, encouraging parents to Say Yes to the Mess – let your kids explore and be creative, then let them help tackle the mess. I was able to take my 3 boys with me to NYC for a special event Swiffer hosted, along with Sarah Michelle Gellar, to launch the Yes to the Mess campaign. Yes, I got to meet her – briefly because my boys had reached their exhaustion limit – but she was just as fabulous as you hear! And yes – that’s my Superman/Iron Man in the photos with her! Love it! Of course, they had several activities for the kids to enjoy – and yes, ALL of them were messy! From decorating cookies…. The found and ‘big cheese’ of The Creative Kitchen led the activities and was super cute with the kiddos! Even though they were super anxious to get going with all the fun, they hung on her every word. I need to bribe her into handling my kiddos’ birthday parties or something, because she’s like the child whisperer! Since the whole theme of the night was letting the kids have fun, explore and really be free to show their creativity, I didn’t hold them back on the frosting or sprinkles. Yes, it was messy. And YES they were hyper for a bit – but they had an absolutely fantastic time, and the mess was nothing compared to that! By letting them have some freedom to express themselves, I also got to see their own interests or personalities show through – from the different colors in their cookie toppings, to the placement or amounts. Such a great way to LEARN ABOUT YOUR KIDS – because we just can’t do that if we’re always telling them ‘no’. I mean, look how thrilled my little Hulk was to just go for it! Although it did take a bit before he felt comfortable REALLY doing things, which is my fault for telling him ‘no’ so many times before, I suppose. It’s a big goal of mine to do better at the ‘yes to the mess’ thing in our home! Going back to my kids being shocked at this new-found freedom, here’s the look I got from Hulk when we told him to get his hands messy and decorate his apron…. And they LOVED their final products! Their biggest question when it was time to go was ‘can we take it on the plane?’ We had to be smart about it with the wet paint, but the aprons made it home! Such a huge grin on his face! I also learned that while some of my boys LOVE getting their hands dirty – my Thor would rather take his time and be careful. Again – say ‘yes to the mess’ and you may learn more about your kids! How many science experiments are clean? Very few fun ones, that’s for sure! They loved making a purple ‘explosion’! Just like Sarah Michelle Gellar explained, parents should do better at saying yes to their kids, because this is how they learn, explore and grow as people. Plus, there’s countless memories to be made – good, bad AND crazy – when they have more freedom to express their creativity! Afterwards, you’ve got plenty of Swiffer items to help clean up the mess in no time at all. Thank you for a fantastic event & trip Swiffer! And I just HAVE to take a moment to say a big ‘THANK YOU’ to Sarah – during the photos of her and the kids, my Superman started looking pretty dazed. I mean, there’s about a dozen flashes going a hundred miles an hour right in your eyes, I’d be dazed, too! But she flat out told the photographers to STOP so she could make sure he was okay and see if he wanted to stop or not. When he said he was fine to continue, she even tickled him a bit so he’d feel more comfortable and relaxed (and smile bigger, more naturally) for the masses of cameras. THANK YOU SARAH! Last month we went an absolutely AMAZING vacation to Disneyland with my family. It wasn’t all Mickey ears and Churros, though, as the 2nd day there we got an awful call – one of our sweet dogs was being rushed to the vet hospital! A very scary week ensued, but in the end she was saved – thanks to wonderful Docters, and a special group of people that truly cared. With a new partnership between Swiffer and BarkBox, we were able to say thank you To the People Who Saved Our Dog! Aren’t our pups adorable? This photo was shot in October 2014, when we first got Tula – the youngest. We’d had Kita in our family about a year, and she needed a playmate. We instantly fell in love with Tula at the shelter, and she quickly became an important member of our family. Not only do Hubby and I adore having these two, but our kids consider them siblings! Well, on our second day on vacation in October this year – so we had her literally ONE YEAR – we got a call from the amazing boarding place where our dogs were: 2nd Family Dogs in McKinney, TX. They noticed Tula wasn’t acting normal, really took the care to check her out, and rushed her to the animal ER once they realized something was terribly wrong with her. During that whole day, through her surgery to fix the bleeding in her stomach, this wonderful group of people kept in touch with us, asking her progress, truly caring if she was ok. They gave Kita extra love and attention, since she was without her ‘sis’. Long story short, Tula made it through – and although all tests and check-ups came back negative so we don’t know why she had this issue, she’s completely fine and back to normal! The amazing thing – beyond just caring, going the extra mile checking on her, reassuring us, and showing Kita with love – this unbelievable group of people helped get us a donation to help us cover her thousands of dollars of medical bills! Can you believe it – without even a blink for themselves, they helped our family in so many ways. I can never repay their kindness – but then my girl Chelsea at Swiffer told me they teamed up with BarkBox! LIGHTBULB MOMENT! Since 2nd Family Dog also helps find homes for animals that are left in their care with no home, we thought it would be PERFECT to gift them with a special surprise package! Not only did they get a Welcome Home Kit from Swiffer – with supplies and coupon goodies to help with the extreme kind of cleaning a dog boarding facility would need, but also some dog-approved toys and treats from BarkBox! 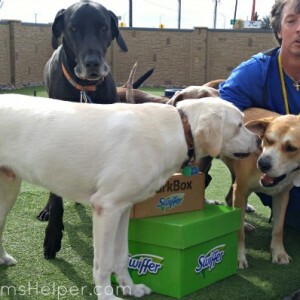 Along with the miracle staff at 2nd Family Dogs, guess who else is getting in on the fun between Swiffer and BarkBox? This hottie…. I’m gonna take this chance to scream THANK YOU to 2nd Family Dogs for being the saving angels they are, and to @Swiffer and @BarkBox for helping us show a little bit of our gratitude to them! Swiffer and Barkbox are teaming up to make sure cleaning concerns are never an obstacle when bringing your child’s first pet. Through December, new pup parents who adopt from partnering shelters will get a free Welcome Home Kit packed with goodies and cleaning supplies. Because with any furry family member… #ShedHappens. I had no idea what to expect this past week on this trip to Cincinnati, Ohio & Swiffer Ambassador Event! Was it going to be full of classes and note-taking? Just networking with the other ambassadors? I was thrilled that it was a great mix of everything, plus plenty of happy surprises! I’ll admit, I was nervous when I learned we were going to visit Cincinnati – what in the world could be awesome about that city? I really loved it, though, especially as we got a private tour all around to learn more about it and see some truly beautiful sites! I really enjoyed the combination of old and new – from monuments and parks, performance centers (music is HUGE here) and museums, to a vast variety of down-right amazing food options. I especially loved Fountain Park – here’s a ‘by day’ and ‘by night’ picture. At night it changes colors and is really beautiful. On Tuesday night me and fellow bloggers Our Three Peas and The Ugly Duckling House enjoyed the patio of a pub in the square and listened to the music they had playing. The weather was even perfect! The Ohio river runs right through and had amazing views – lots of greenery and bright blue skies to offset the huge buildings of the city. They roomed us at the 21C Museum Hotel in Cincinnati, and at first I thought the idea of having a museum mixed with hotel was awkward – but ended up really loving it. The staff was AMAZING – and that’s no exaggeration! So helpful, knowledgeable about the area, and really wanted to just be happy and make your day better. The rooms were impressive – with a GINORMOUS bed all to myself. I could lay ‘starfish’ on it and not quite touch any edges. Plenty of desk space for working, and artistic touches throughout – like the random tiles with things like a nose, ear, or mouth in the bathroom. I told hubby I’d love to bring him here. Wondering about the large yellow penguins? The hotel has TONS of them all over, and people have fun moving them around. Some days I was greeted by one outside my hotel room, another day I enjoyed an elevator ride with the fun companion. The art museum, open 24 hours, was fun – my favorite was the ‘healing tiles’, shown in this photo near the bottom. The ’tiles’ spread as you walk across, then heal back to how they were. Y’all know I love good food – like a LOT! The Swiffer team didn’t disappoint, treating us to beautiful views and tasty offerings at the Montgomery Inn Boathouse the first night – with a beautiful view with a RAINBOW after a slight downpour. For dinner our last night, they really spoiled us by going to the highest ranking steakhouse in Ohio – Jeff Ruby’s Steakhouse! Even if I didn’t already want to return for more site-seeing and such of Cincinnati, this restaurant was enough to bring me back. Such a beautiful, elegant atmosphere with top-knotch, attentive staff and AMAZING food – seriously, I can’t praise the deliciousness enough! Their prices are higher than I’d normally spend – but if you can, maybe for a special occasion or something – it’s totally worth it. My mouth is watering just remembering the filet mignon I enjoyed. 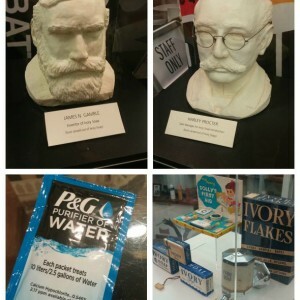 During the ambassador event, we got a personal tour of the P&G (Proctor & Gamble, if you weren’t sure) archives – I had no idea the history of this great company, or the neat ways one little change or discovering led to many other products we use today. Starting as a small candle and soap company and growing into this HUGE empire just blows me away! And yes, those heads of Proctor and Gamble are made of wax 🙂 And did you know they invented soap operas – it was a way to advertise their soaps! At P&G headquarters, we learned a lot of the science behind the Swiffer products – what makes them work so well, changes they’ve made over the years to really make them the best on the market, and even did a couple ‘science experiments’ testing them out! At home my hubby was trying out the Swiffer Sweeper against our dogs’ hair problem – it definitely works to attract it well, as you can see! I’m so glad I was selected to be a Swiffer Ambassador and attend this fun trip – and look forward to sharing my love of Swiffer and many more fun things with y’all over the coming year!